ORS™ Olive Oil Announces Brand Refresh with Enhanced Ingredients & Fresh New Look. Edge Control™ & Nourishing Sheen Spray™ now feature Nourishing Olive Oil + Power-Packed Oils. CHICAGO--(BUSINESS WIRE)--Namaste Laboratories, makers of ORS™ hair care, is tipping off the new year with a new look for its iconic ORS™ Olive Oil! The brand, which creates hair care and styling products for all hair types and textures, introduces a “Fresh New Look” to its packaging and a formula update to some of its most popular products. Known for its wide range of healthy hair styling and maintenance solutions, ORS™ Olive Oil products feature Nourishing Olive Oil and are now infused with a range of nutrient-rich, Power-Packed Oils such as Sweet Almond Oil for strengthening and Coconut Oil for restorative shine. The refresh comes at a time when ORS™ aims to push its continued commitment to excellence and innovation by offering updates that further enhance the consumer experience. “We’re continually engaging with our consumers to make sure we’re meeting their needs, and they’ve told us that they’re ready for more from their trusted Olive Oil products. This insight was the starting point for our refresh, which we’re excited to bring to life. We enhanced our products with additional ingredients that provide more moisture, more strength and more shine and we’ve updated our packaging,” says Nicole Ray Robinson, Category Marketing Head at Namaste Laboratories. Among the first ORS™ Olive Oil products available in the new look are Edge Control™ and Nourishing Sheen Spray™. ORS™ Olive Oil Edge Control™ Hair Gel (2.25 oz. net wt., SRP $5.49), one of the brand’s most prominent products, has been revamped for an overall better styling experience. ORS™ was the first major brand to launch with an edge hair gel and was instrumental in starting this product category. 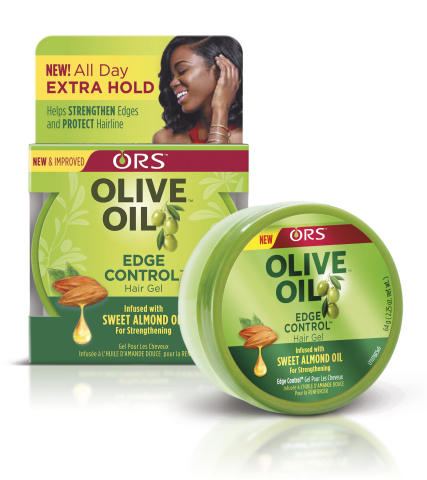 As part of its refresh, ORS™ has refined its Edge Control™ formula, which now combines the power of nourishing Olive Oil with strengthening Sweet Almond Oil to help strengthen, protect and moisturize edges while delivering sleek styling and control. The updated non-flaking, non-whitening formula additionally now provides All-Day, EXTRA HOLD for style that lasts. Also updated is ORS™ Olive Oil Nourishing Sheen Spray™ (11.7 oz. net wt., SRP $4.99 & 2 oz. net wt., SRP $2.59), which is now infused with restorative Coconut Oil to amplify moisture, nourishment and shine. The new and improved sheen spray delivers long-lasting, brilliant shine and helps revitalize dry, thirsty hair. The nutrient-rich, lightweight formula is also accompanied by a new fragrance and no-clog sprayer for a better overall application. This fan-favorite is perfect for women and men, alike! The new and improved ORS™ Olive Oil Edge Control™ Hair Gel and ORS™ Olive Oil Nourishing Sheen Spray™ are available at select retailers across the country including Walmart, Walgreens, Target, CVS, Rite Aid, Sally Beauty, Dollar General, Family Dollar, as well as at fine beauty supply stores and orshaircare.com. ORS™ is the Original Root Stimulator™. A leading brand in the ethnic hair care market, ORS™ provides a wide range of healthy hair maintenance and styling solutions for all hair types, textures and styles. Founded in 1996 to fill a void in the market for healing hair care specifically for women and men of color, ORS™ aims to meet the hair care needs of health-conscious, style-seeking multicultural consumers with innovative products that feature the highest quality natural ingredients to help protect and maintain hair health. The ORS™ portfolio includes ORS™ Olive Oil, HAIRepair™, HAIRestore™ and Curls Unleashed™. ORS™ products are available at national retailers, fine beauty supply stores and orshaircare.com. ORS™ is committed to celebrating the beauty of women regardless of hair type or texture. Its commitment to women of color was recently showcased in its award-winning Olive Oil No Stereotypes campaign, which was designed to empower women to embrace their unique beauty. ORS™ recognizes and advocates for the incredible diversity and unique personal style expression that comes through all the various types, textures and styles of ethnic hair. ORS™ stands strong for healthy, versatile, beautiful hair and believes that Beautiful Hair Comes in All Types, Not Stereotypes. For more hair care news, product information and tips please visit orshaircare.com or connect with us on social media at www.facebook.com/orshaircare and @orshaircare on Twitter and Instagram. Namaste Laboratories, makers of ORS™ hair care, is tipping off the new year with a new look for its iconic ORS™ Olive Oil!